At this point, you may be wondering why I would choose to go on reviewing a show that causes me such routine frustration. And you’d have a point; despite positive grades (which I stand by! ), these reviews have thus far been a litany of complaint, critique, and cutting commentary—terribly insightful, of course, but not exactly optimistic. Yet I do enjoy A Series Of Unfortunate Events, as much as one can enjoy such a never ending river of misery, despair, and very depressing wetness. If it was simply a bad show, built on a bad premise and full of poor performances, it would be simple to dismiss. But for every frustratingly buried plot development or overlong comic interlude, there’s a joke that lands beautifully, or a clever visual gag, or (far rarer but still important) an effective emotional beat. "The Ersatz Elevator, Part Two"
“The Ersatz Elevator: Part TWO” doesn’t make up for the sluggishness of the story’s first half, and, unsurprisingly, it’s suffering from many of the same problems that have plagued the show from the start. But it does have a little more urgency, and a climax that’s a lot more satisfying than the musical number from the previous entry. Best of all, it clocks in at a comparatively lean 40 minutes. It’s not precisely tight, but that’s a lot less time for the sort of looping back nonsense that made “Part ONE” such an intermittent chore. So: the Baudelaires have discovered the Quagmires, locked in a cage at the bottom of the ersatz elevator shaft (the elevator is ersatz, the shaft is quite real). They come close to getting some answers, only for time to run out before anyone can say anything of real value, apart from confirming that the initials “V.F.D.” are important, and the fact that the spyglass the kids have been carrying around can do more than just look at things. It’s also a flashlight and a small heat source, which Violet uses to power the balloon to get the kids back up the elevator shaft before Esme can drag an unconscious Jerome back into their apartment. Okay, so I promise I’m going to say nice things soon, but—the sequence of the Baudelaires trying to get back up to the top of the shaft in time is a good example of the sort of thing I’m talking about when I say the show is padded. Halfway back up the shaft, Violet realizes the spyglass is burning through the handkerchief; so she turns it off, and they plummet back down a bit, before she turns it back on and they go up to the top. There’s not a lot of suspense here—for one thing, Olaf isn’t even with Esme, and Gunther hasn’t revealed any horrible plan to grab the kids. 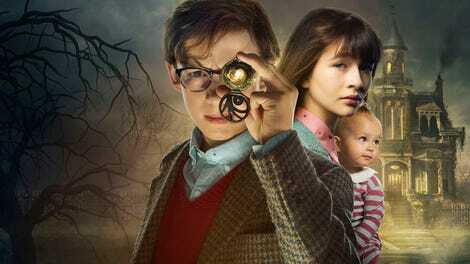 For another, there’s no serious doubt that the Baudelaires aren’t going to get out of that shaft. It’s just a complication that fails to tell us anything new about anyone involved, apart from the fact that Louis Hynes (as Klaus) has unsettlingly convincing scream. Contrast that with a later moment when Esme briefly pretends to be on the children’s side. It’s a legitimately unexpected turn, largely thanks to Lucy Punch’s performance; her switch from shallow, hateful narcissist to concerned and caring adult is convincing enough that I found myself wanting to believe, even if everything else that had ever happened in the series up to this point told me otherwise. 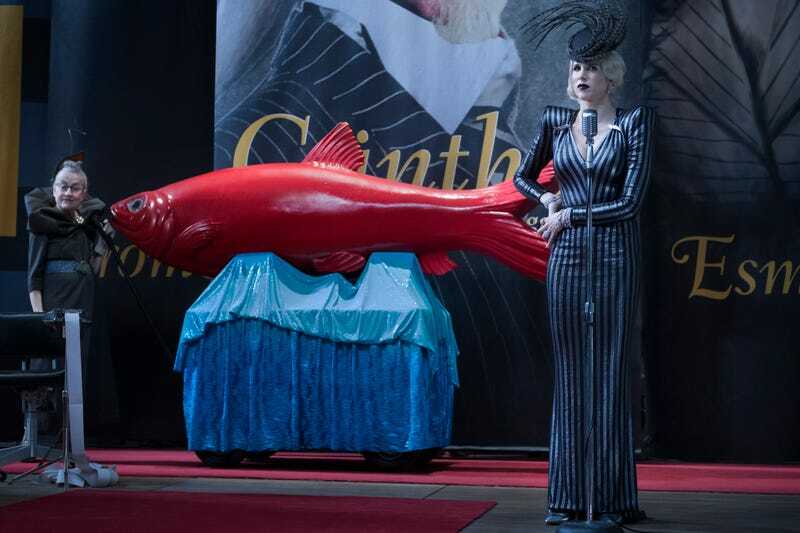 Which is maybe another reason why this is such a struggle—Lemony Snicket’s constant deadpan assertions that we’d be better off watching something else have lost all novelty by this point, and while it’s obviously important to the show’s tone, the lack of variance makes those extra minutes all the more painful. Still, the bit where Esme plays nice only to shove the kids down the elevator shaft is lovely, and the reveal that she’s Count Olaf’s girlfriend (he was her acting coach) at least offers a new kind of betrayal, one driven by passion as much as greed. Surprisingly, there are no jokes as to how Olaf is just manipulating her for her help—he really does seem to care for her, in his murky, self-obsessed way, and when Esme leaves Jerome at the end of the hour, it plays like a positive move for all three, at least in terms of personal growth. The climax shifts from the Baudelaires saving themselves to the Baudelaires trying to save someone else. Olaf is planning to auction off an item with the Quagmires hidden inside it to one of his henchpeople, a scheme which makes little to no sense but at least allows our heroes a chance to try, and fail, to buy their friends right out from under the villain. The auction allows for nearly every member of the cast (Olaf, his crew, Esem, Poe, Mrs. Poe, Jacquelyn, Larry, Olivia, Jacques, and the Baudelaires) to come together for one loopy, moderately suspenseful sequence that ends with Olaf for once completely triumphant; the Baudelaires pick the wrong item, and the Quagmires are spirited away in a statue of a (wait for it) red herring. The loss finds the children even more determined to save their friends, and that sense of increased agency (they could be theoretically safe with Jerome, who offers to go on being their guardian; but he’s too scared to help them go after the Quagmires, so they turn him down) helps to make this more than just another iteration on the established routine. Earlier, the Baudelaires discovered the underground tunnels we’ve seen various characters moving about in throughout the series, tunnels which lead directly from the Squalors’ home to the ashes of the Baudelaire mansion. It’s a reminder of the stakes of the conflict, and a poignant reminder at that. The Baudelaires did once have a place where they felt safe and protected, with guardians who loved them and wanted what was best for them. But that’s gone; and the more time passes, and the more guardians (well-meaning or otherwise) fall by the wayside, it becomes increasingly likely that the Baudelaires are on their own. “This story is not about a happy reunion.” As funny as Snicket’s routine interjections can be, the constant reassurance that nothing we’re about to watch is going to work out the way we want it to makes it even harder to build tension. Since we can be reasonably sure that neither the best nor the worst is going to happen, it’s hard to get too worked up about any of it. Is this the first mention of the sugar bowl? The V.F.D. box that the children bid on (“V.F.D.” here stands for “Very Fancy Doilies”) is “lot 49,” and at one point Count Olaf mentions “the crying of lot 49,” which happens to be the title of an early Thomas Pynchon novel. Conspiracies play a large part in Pynchon’s work. Jacques also has an eye tattoo on his ankle, just like Olaf. Curiouser and curiouser! The back and forth between Sunny and the Hook-Handed Man is adorable.